This Web module presents information on Illinois forests. It covers the topics of forest and tree classification, ecology, and conservation. The module also describes how people (Native Americans and European explorers and settlers) used and changed Illinois forests. Ancient Forests describes how forests in Illinois looked during the Ice Ages and the period following the Ice Ages. It relates how Museum researchers reconstruct environments from fossil remains and other sources. This module features objects and specimens from the Illinois State Museum collections. Handmade domestic objects from the decorative arts collection illustrate how people used wood from the forest. Specimens from the herbarium and fossil collections illustrate Illinois State Museum research and the history of Illinois forests. Images of artworks from the fine arts collection show how forest landscapes and trees have inspired artists. Primary sources are featured in the historical sections. Maps and interactive images, such as panoramas, help viewers locate and understand the relationships of Illinois forests. An Illinois Tree Guide contains images, a detailed description, and a distribution map for each species. Plans for interdisciplinary activities extend the module content and address the Illinois State Board of Education Goals and Standards. Glossary words conveniently pop up in separate windows and the entire glossary can be printed out for vocabulary practice. Print and Web resources are listed for viewer's further research. There is also a bibliography of sources used in the text. 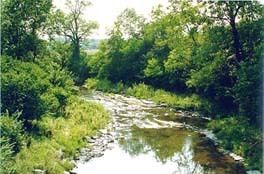 Partial funding for the "Forests of Illinois" module was provided by the Illinois Department of Natural Resources Forestry Division and the U.S. Forest Service.